The Mountain Between Us is a romance-disaster novel, written by American author Charles Martin. The story focuses on Dr. Ben Payne and writer Ashley Knox as they get stuck on High Uintas Wilderness after a plane crash. The novel was published by Broadway Books on June 28, 2011. A film adaptation starring Idris Elba and Kate Winslet was released on October 6, 2017. On a stormy winter night, Dr. Ben Payne and writer Ashley Knox are stuck in Salt Lake City airport when their flights are canceled. Both are eager to reach their destinations—Ben has patients waiting, and Ashley is to be married the following day. Ben hires a charter plane and offers Ashley a seat, but when their pilot suffers a fatal heart attack in flight, the plane crashes, leaving them stranded in the High Uintas Wilderness. Though they survive the impact with injuries (Ben has broken ribs and Ashley suffers a terrible leg fracture), they are faced with harsh weather conditions and the fact that no one knows they are missing. The ordeal leads them to depend on one other for survival, and ultimately brings them closer. Terry Miller Shannon, writing in The Book Report, called it "not only a page-turner of an adventure story; there is a moving emotional counterpart to the physical journey these characters undertake." 20th Century Fox adapted the novel into a feature film, with Hany Abu-Assad directing. Kate Winslet and Idris Elba played the lead roles. The film premiered on September 9, 2017 at the 2017 Toronto International Film Festival, and was theatrically released in the United States on October 6, 2017, by 20th Century Fox. ^ "Charles Martin Goodreads". Retrieved November 30, 2016. ^ "The Mountain Between Us: A Novel Paperback – June 28, 2011 by Charles Martin". Retrieved November 30, 2016. ^ "THE MOUNTAIN BETWEEN US (2017)". Retrieved November 30, 2016. 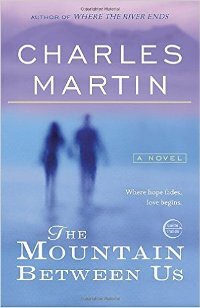 ^ "Review The Mountain Between Us by Charles Martin". Retrieved November 30, 2016. ^ "See Idris Elba, Kate Winslet stranded in the wild in 'Mountain Between Us'". USA Today]]. Retrieved May 31, 2017.